A garda involved in the search for Bobby Ryan eight years ago has said he became “unhappy” with where he thought the missing man’s body was found after watching a recent television news broadcast. 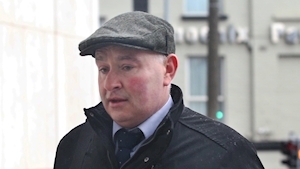 Garda Tom Finnane was giving evidence in the trial of Patrick Quirke (50) of Breanshamore, Co Tipperary has pleaded not guilty to the murder of Bobby Ryan, a part-time DJ going by the name Mr Moonlight, on a date between June 3, 2011, and April 2013. The deceased went missing in June 2011 and his body was found in April 2013 in an underground wastewater tank on a farm at Fawnagowan owned by his girlfriend Mary Lowry and farmed by Mr Quirke. He told Mr Condon that he asked to see the photograph because he wasn’t happy with what he initially thought was the location of where the body was found. He had thought the body was found in a slurry tank behind one of the sheds but became “unhappy” with this after seeing footage on “TV3 News” showing the body to have been found in a different area. When he saw the correct location of the body he said he remembered seeing between ten and fifteen round bales of silage in that location. He said he has not discussed his evidence with anyone else.